Young children often struggle to understand concepts of time. Words like "past," "present," and "future" can be confusing at this developmental stage. Children are best able to understand the passage of time as they experience it. Morning calendar rituals, daily schedules, and birthday celebrations are all meaningful ways that children experience time. In a Montessori classroom, we expand on those opportunities by incorporating learning materials to reinforce those same lessons. For a child's birthday celebration, he carries the globe around the "sun" (a candle) once for each year of his life. Families often work together to create a personal timeline of the child's life, complete with photos and anecdotes representing each year of the child's life. Other areas of the curriculum reinforce the concept of the passage of time--lifecycles, art history, historical holidays, fossils, antiques, etc. The concepts of time and historical time are presented and practiced through many activities and are repeated at deeper complexity over the course of the three year cycle. Children measure time in a Montessori classroom by revisiting the calendar daily. As the days go by, the child gains an understanding of yesterday and tomorrow. 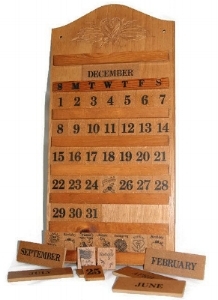 Using a calendar, students are able to track the passing of the years, seasons, months, weeks, and days. With each passing month, children enjoy creating their own calendars. Sometimes tracing the numerals, children practice rote counting the days of the month, noting special holidays or upcoming celebrations. One of the daily reminders of the passage of time is the clock. Nowadays, the child is presented with digital representations of time. It is important to give him an impressionistic understanding of an analog clock face as well. The hours are taught first, then the hands (long and short). Children quickly learn that when it is exactly the hour, the long hand points up and the short hand points to the exact hour of the day. When the child can find and make the hours you dictate, you can show him minutes beyond the hour. As an extension of this work, the child can make cards using a clock face stamp, deciding on a time to make and writing the numerals. Then he can draw in the hands on the clock face.